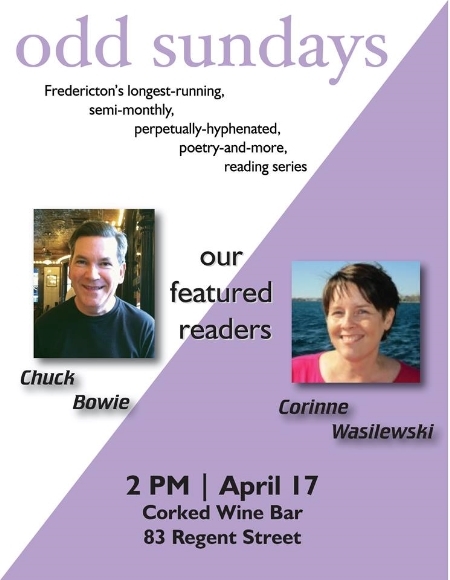 Fredericton’s longest-running, semi-monthly, perpetually-hyphenated, poetry-and-more, reading series, odd sundays comes back together next on Sunday, April 17th, when the featured guests will be Corrine Wasilewski and Chuck Bowie. So mark your calendars and get a spring in your step to gather once again on April 17th at 2 pm at Corked Wine Bar, 83 Regent Street, in Fredericton. Get a drink, hot or cold, find a seat, and enjoy an hour of reading from Corrine and Chuck, and the readers at the open mic. Don’t forget to get a ticket in anticipation of the book draw. Corinne Wasilewski was born and raised in Woodstock, NB but now makes her home in Sarnia, where she works as an occupational therapist. Her short stories have appeared in Front & Centre, The Windsor Review, The Nashwaak Review and The Battered Suitcase. Live from the Underground is her first novel. An early version of the manuscript was awarded the WFNB’s David Adams Richards Prize in 2012. Chuck Bowie graduated from UNB with a BSc. His writing is influenced by the study of how people behave, habits he developed as his family moved 19 times in his first 21 years. Chuck is involved in music, supporting local musicians, occasionally playing with them. He is working through the fourth novel in the series: “Donovan: Thief For Hire”, titled The Body On The Underwater Road. Chuck and his wife Lois live in Fredericton. They have two adult musician sons.